Prime Minister Narendra Modi and his Bangladesh Counterpart Sheikh Hasina witnessed exchange of 4 agreements and MoUs out of 22 signed between the two nations, following delegation level talks in New Delhi. Both the leaders also inaugurated the trial run of the Kolkata -Khulna passenger train service through video link from New Delhi. This is the second passenger service between the two countries. The first such service 'Maitree Express' was flagged off between Kolkata and Dhaka Cantonment stations in April 2008. A bus service also was inaugurated between Kolkata-Khulna-Dhaka. Besides, the Park Street in New Delhi has now been renamed after Bangladesh's founder Sheikh Mujibur Rahman. Rahman was the central figure in Bangladesh's liberation movement and served twice as the Bangladesh President. Prime Minister Narendra Modi called Sheikh Mujibur Rahman as dear friend of India and a towering leader. The two the leaders also jointly released Hindi Translation of the book "Unfinished Memoires" by Bangladesh founder, Bangabandhu Sheikh Mujibur Rahman. In a joint statement, issued following exchange of agreements, Prime Minister Narendra Modi said that spread of radicalization and extremism poses grave threat to India, Bangladesh and entire region. He said that India and Bangladesh have agreed to enhance cooperation in fight against terror. Prime Minister Modi also said that peace, security and development are central to engagement. He also announced agreement on armed forces cooperation & Line of Credit of $ 500 million for the defence procurement of Bangladesh. He also expressed his firm belief that only his government and the govt. of Sheikh Hasina can & will find an early solution to Teesta Water Sharing. 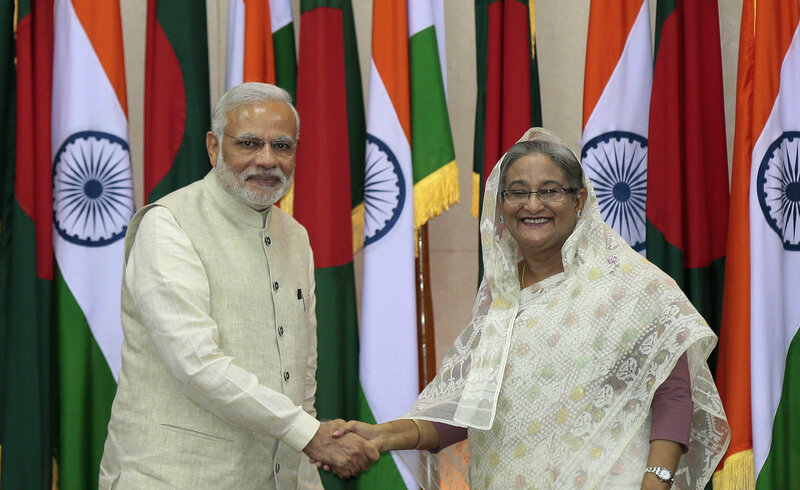 Prime Minister Narendra Modi also thanked Bangladesh Prime Minister Sheikh Hasina for her decision to honour Indian martyrs of Bangladesh liberation war. Reiterating her resolve to continue her fight against terror, Bangladesh Prime Minister Sheikh Hasina said that both India and Bangladesh have agreed to cooperate in fight against terror. After engagements at Hyderabad House in New Delhi, both PM drove in the same car to Manekshaw Centre, venue of the Sammanona Ceremony to honour the Indian Armed Forces soldiers who fought for the liberation war of Bangladesh.